Recently I stumbled over a site which publicly served their Dockerfile. That particular instance wasn’t very interesting. But I started to wonder how widespread this is and what sites are exposing due to that. By all means, this isn’t exactly new. You can find /Dockerfile in the SecLists repository for a while. However, it seems that so far nobody (publicly) investigated this. I’m also still operating a bunch of sites that are in the top 1 million list and I couldn’t find a single request for this file in my (limited) log files. So I’ve started to do my own scan of the Alexa top 1 Million sites list. This work was heavily inspired by the research of Hanno Böck in the past and in particular I used his wonderful tool snallygaster to conduct most of the scans. Thanks Hanno! Basically you describe exactly how the container is configured, which packages are installed and what commands are being ran in the process of building it. As you can see it doesn’t necessarily contain sensitive information. In the above example we don’t even see which files are copied to the NGINX document root. Out of the 1’000’000 sites 659 served a Dockerfile. There is large reuse of existing Dockerfiles, one in particular was used 105 times. Overall this boils down to 338 unique Dockerfiles being served. The remaining 298 were uniquely used by only one site. Not much there that we couldn’t also figure out by looking at the site directly. It’s nice to know exactly which PHP modules are used on the server, this might be useful in some cases. Overall I found SSH keys, npm tokens, TLS keys, passwords, AWS secrets, Amazon SES credentials, countless configuration files and source code of some of the applications. These are of course the extreme examples which are to be expected on such a wide range scan. By default the Dockerfile is not copied into the container and certainly not to a publicly served folder. With the first COPY line they copy everything in the current folder to a publicly served folder. Afterwards configuration files get copied. 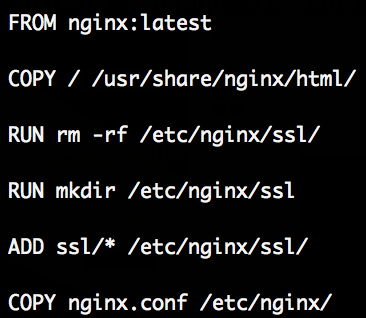 With this both the nginx.conf and the complete ssl directory are public. We can now simply fetch the nginx.conf, lookup the name of the certificate and key files and then fetch those as well. In some cases there was no such COPY command. 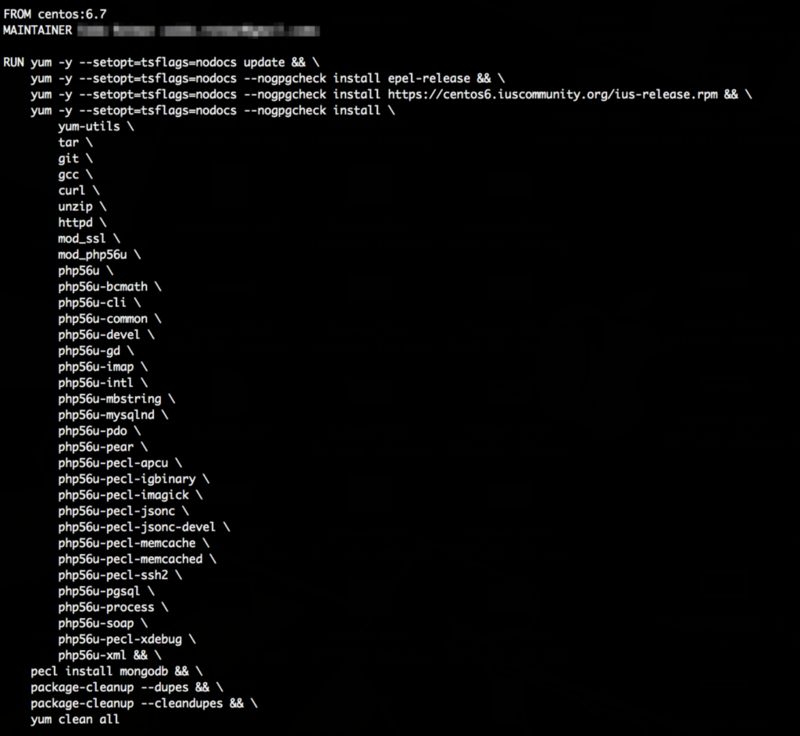 I can only guess that the files ended up due to another mistake in the document root, possibly unrelated to Docker. With only 0.066 % of sites exposing a Dockerfile this doesn’t look like a very widespread problem. And on top of that only a subset of those – less than 100 – expose really critical information that can lead to a compromise. But in any case, it rarely makes sense to publicly serve a Dockerfile. Even if you don’t include any keys, passwords or other secrets: It still doesn’t make sense to give everyone a blueprint of your system. The sites that don’t expose anything critical right now might start in the future when changes are made to this seemingly private file. It’s generally good advice – even if you don’t use Docker – to simply check your public webroot folder for any files that shouldn’t be there and remove them. Following up a bit on my recent post “Looking at public Puppet servers” I was wondering how an attacker could extend his rights within the Puppet ecosystem especially when a system like Foreman is used. Cross site scripting could be useful for this, gaining access to Foreman would allow an attacker basically to compromise everything. I’ve focused first on facts. Facts are generated by the local system and can be overwritten given enough permissions. Displaying facts in the table seemed to be secured sufficiently, however there is another function on the /fact_values page: Showing an distribution graph of a specific fact. When the graph is displayed HTML tags are not removed from facts and XSS is possible. Both in the fact name (as a header in the chart) and fact value (in the legend of the chart). That’s fun but not really useful, tricking someone to click on the distribution chart of such a weird fact seems impractical. Still needs interaction. But if you inject a value into all the graphs it may not take long for an Administrator to hover over one of those. However: By default Foreman uses CSP. Stealing someones session with this setup is not easily possible. So my initial plan to steal an Administrators Foreman session failed in the end. This was tested on Foreman 1.15.6 and reported to the Foreman security team on 2017-10-31. CVE-2017-15100 has been assigned to this issue. A fix is already implemented and will be released with version 1.16.0. A few weeks ago ownCloud 4.0.0 was released and it included some cool features like encryption of uploaded files. I decided to take it for a spin again. I found again some XSS vulnerabilities. As last time, I reported these issues to the ownCloud team which responded quickly and fixed them already (with version 4.0.2). As far as I can tell CVE-2012-4396 was assigned to these issues (and others were merged into it as well). Now this is fun! Imagine someone sending you a MP3 which you listen to with ownCloud and in the background your cookies are sent to a remote system. If you run a ownCloud instance with multiple users, you can also share those files. It might be enough to listen to a shared MP3 to get your account compromised, I didn’t verify this though. Can’t think of a good scenario for this to be useful. Maybe sharing this file. This was a bit surprising as the normal calendar view was not affected, only the list view. A few weeks ago there was a bit of a hype about ownCloud when they released version 3.0.1. I decided to give it a spin, here is what I found. Note: I contacted the development team earlier and these vulnerabilities have been fixed in the meantime with version 3.0.2, although I have not confirmed this myself due to lack of time. It may be possible to create the folder directly in /, however I couldn’t get that folder shared with other users. But since it gets automatically shared if the parent folder is shared, I didn’t invest much time into that. will also execute. 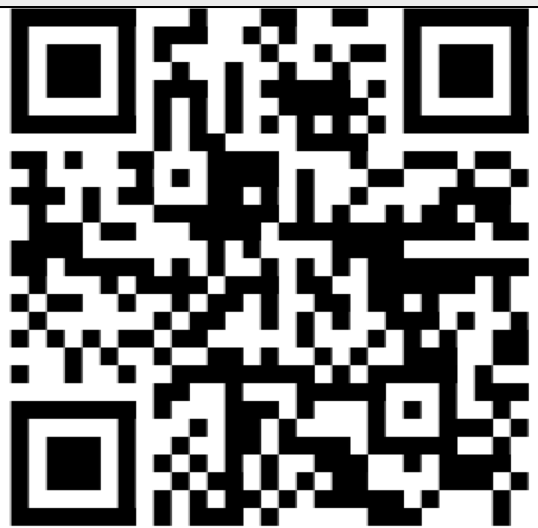 However, since you cannot share contacts between users (or can you?) I believe this is a minor problem. Last week I had some time to play with the monitoring tool Xymon. Xymon is a monitoring and alerting software mostly written in C. Its server component provides you with a web-interface to check the health of your systems. I only quickly investigated this web-interface.